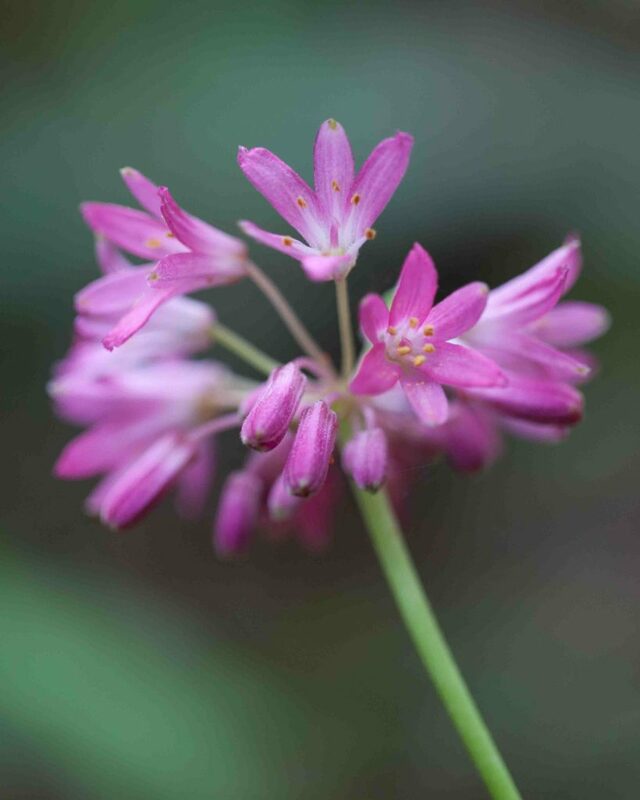 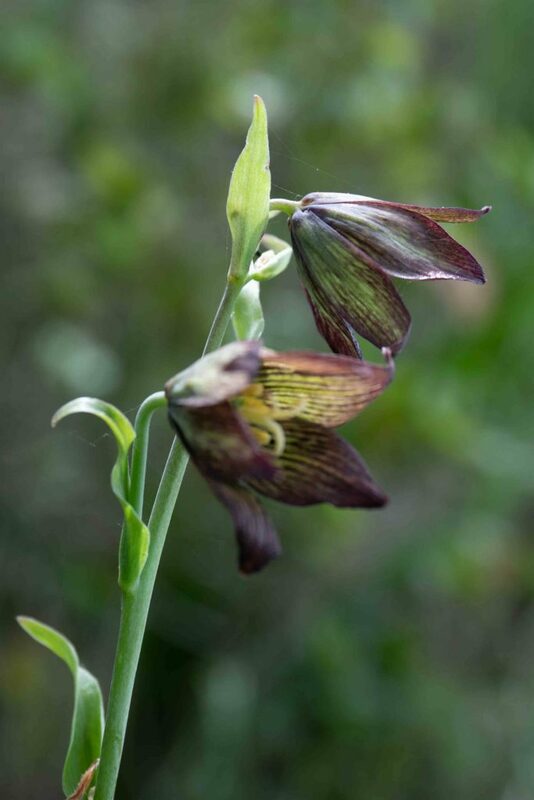 A very striking plant, each stem with 2–4 pendulous flowers, 1–4 cm long and sadly very short-lived. 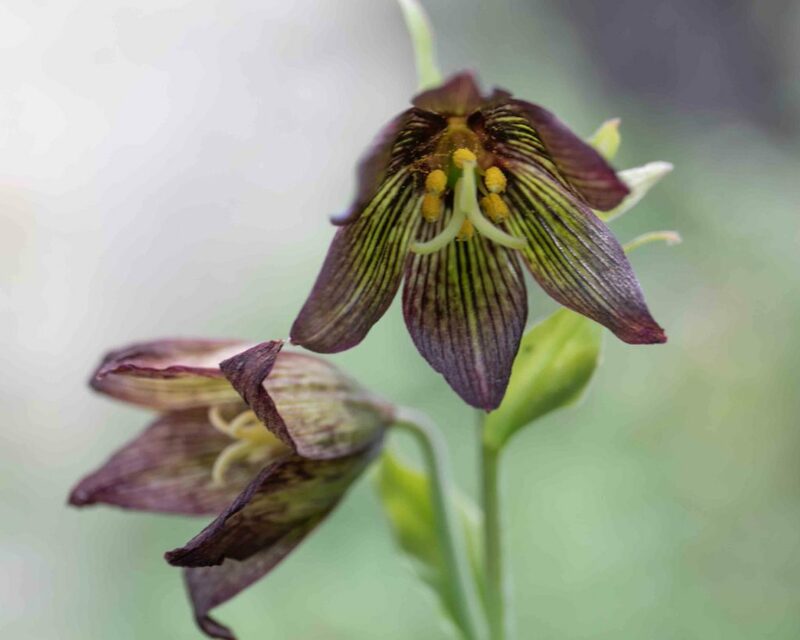 Petals are yellowish-green mottled purple or brown-purple mottled yellow. 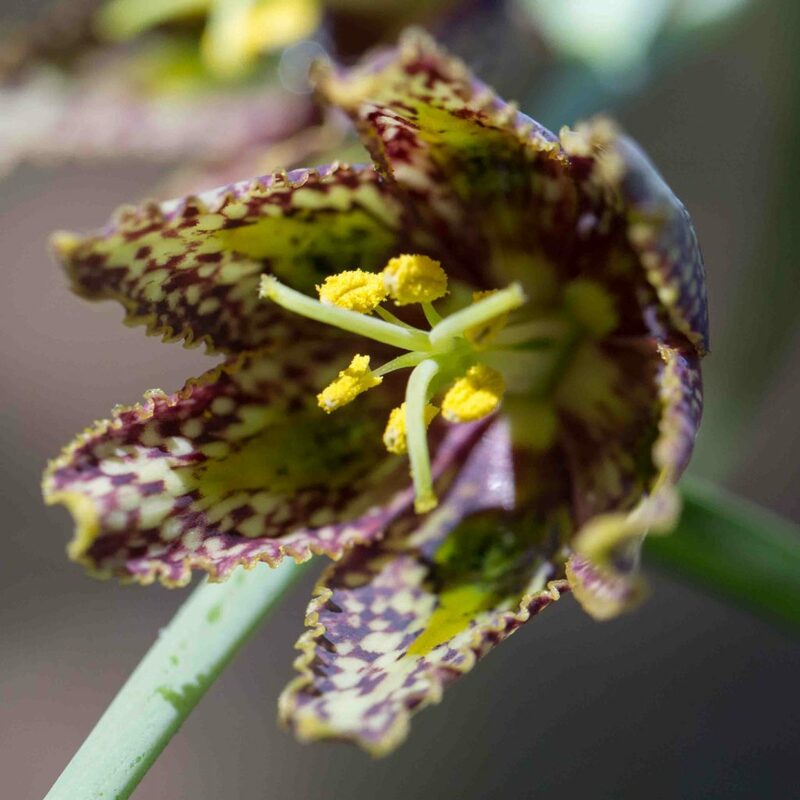 Yellow anthers surround the 3-cleft spreading style. 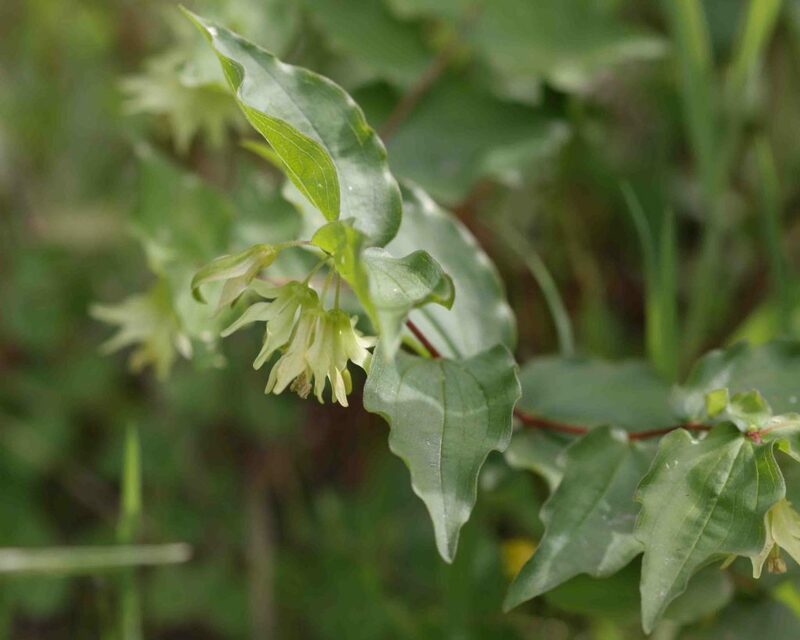 Lower leaves are whorled, the upper alternate. 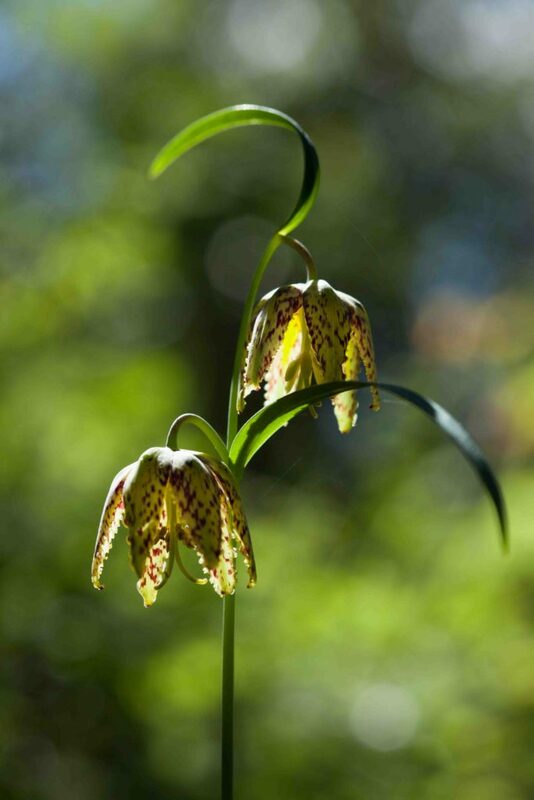 A rather rude name for this unusual fritillary even if its aroma is not its most enticing feature. 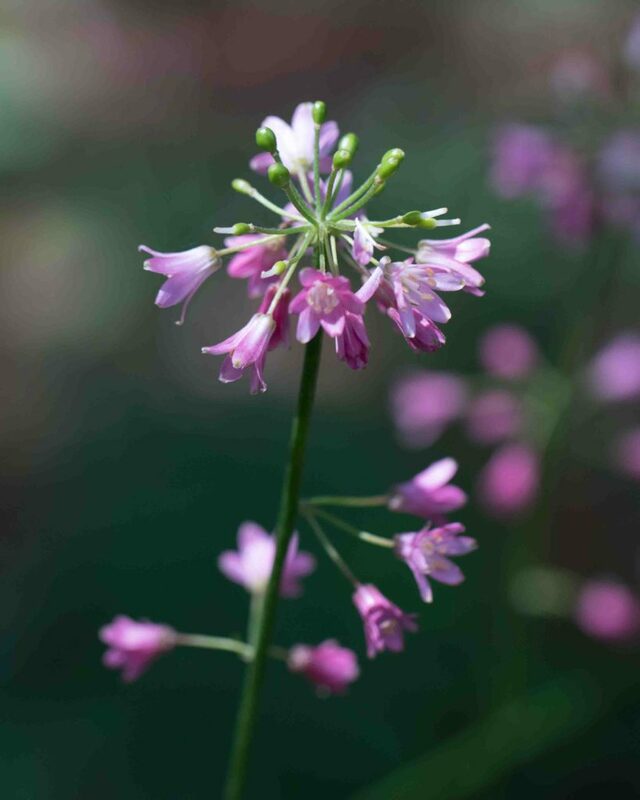 Each stem has 2–4 pendulous flowers. 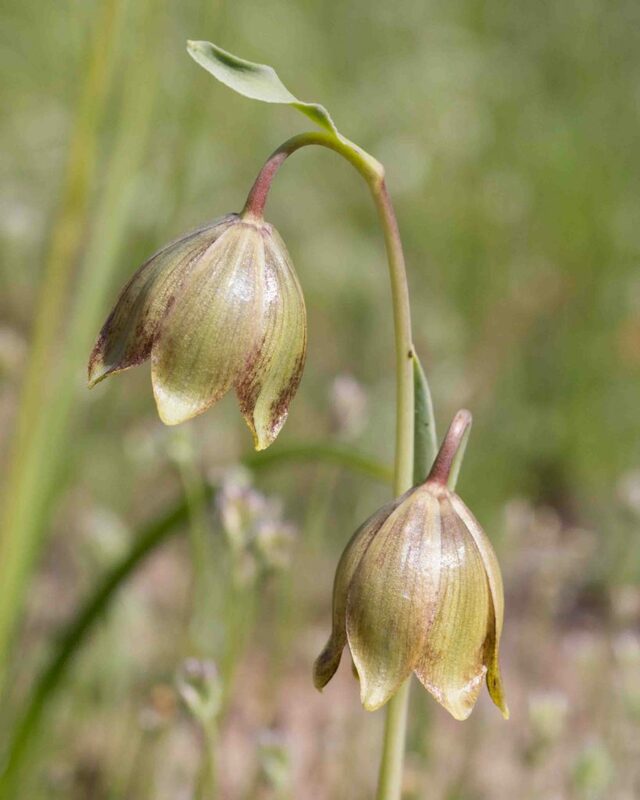 The petals are 18–35 mm with outcurved tips, pale green with brownish streaks, brownish-streaked and striped inside. 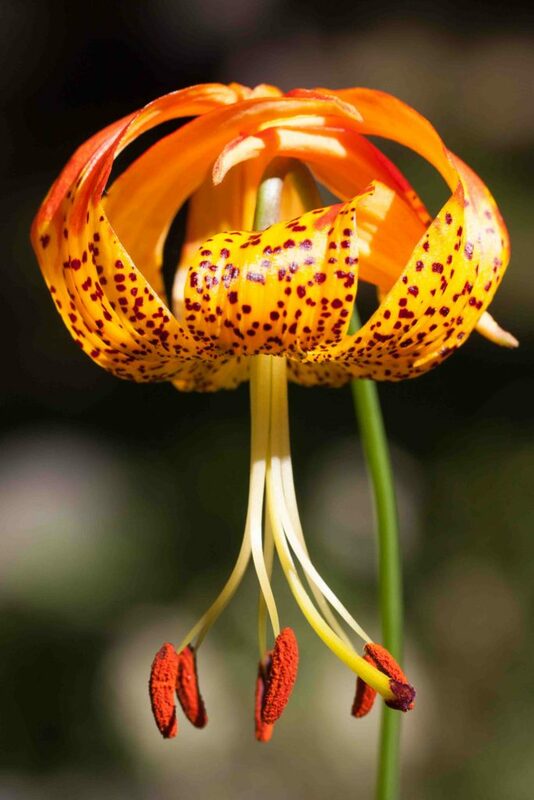 Yellow anthers surround the 3-cleft spreading style. 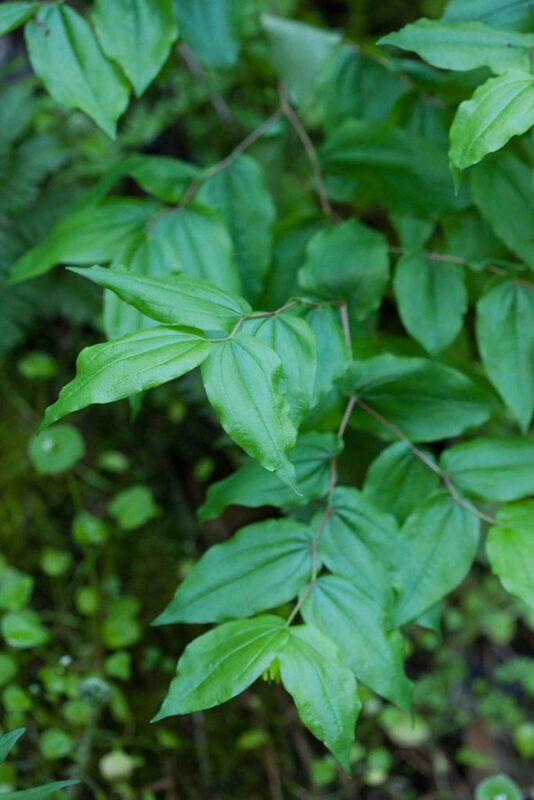 There are 5–12 leaves, crowded below the mid-stem. 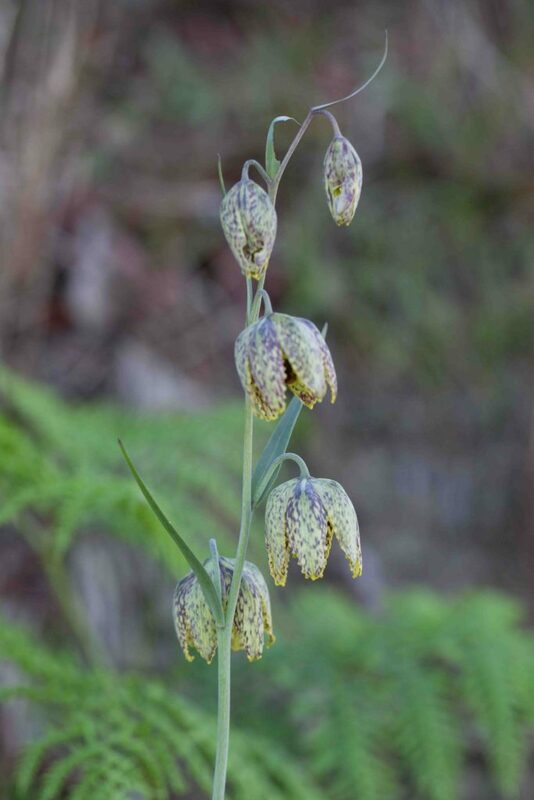 A very distinctive fritillary with the flower color amply justifying the plant’s common name. 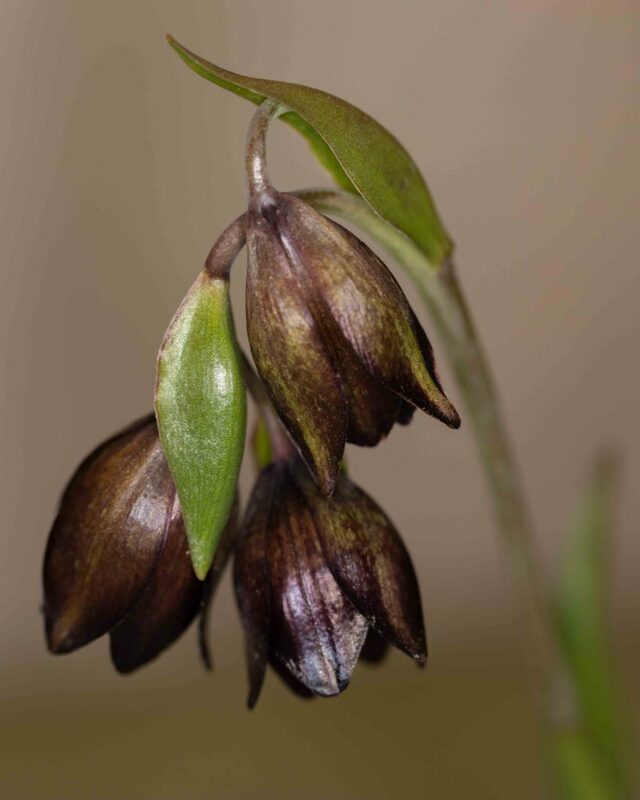 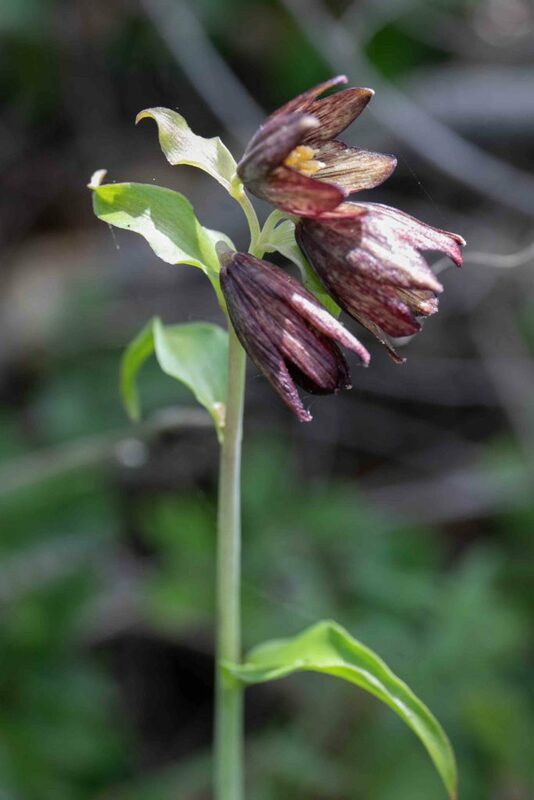 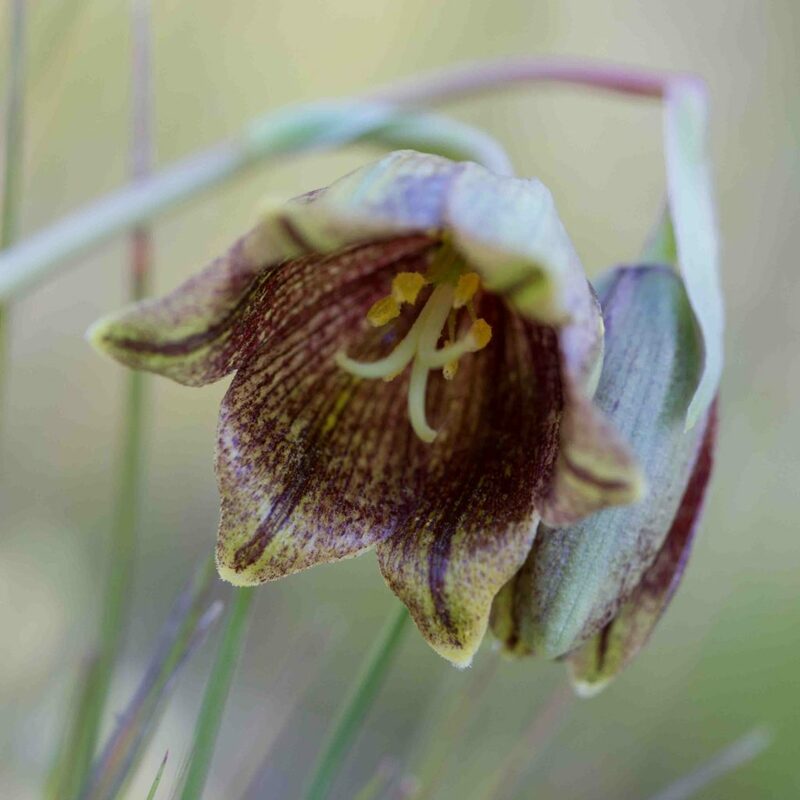 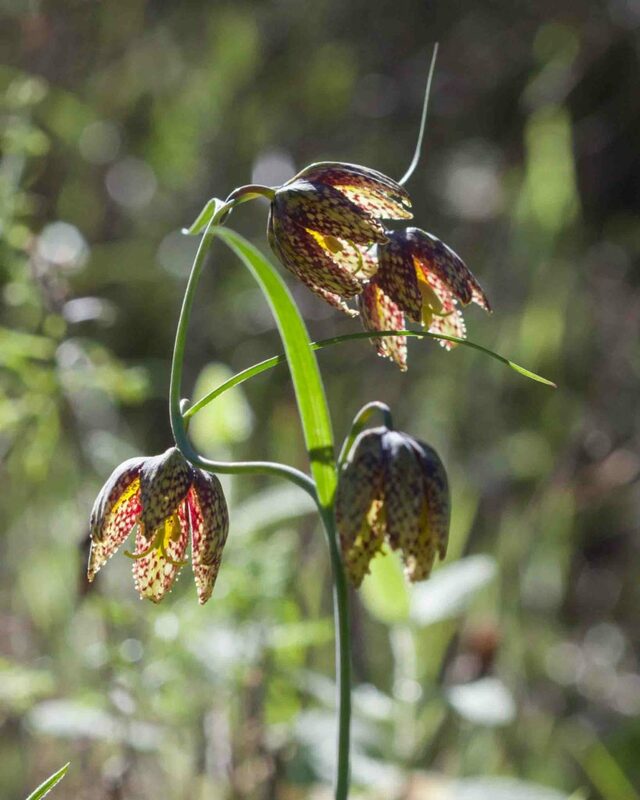 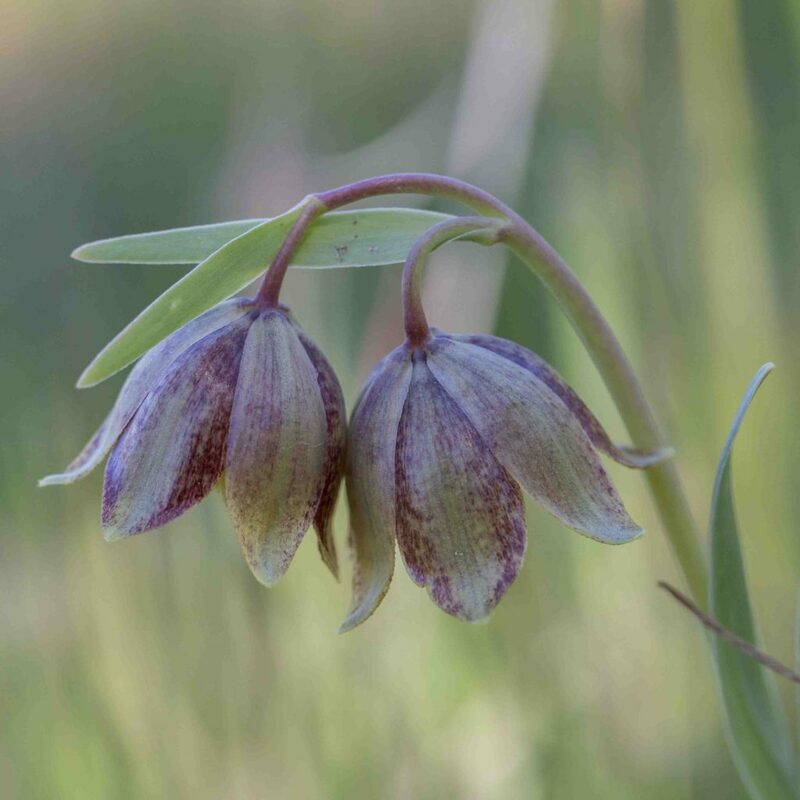 The flowers are similar in shape to Stink Bells (Fritillaria agrestis) but the color is very different, dark brown with greenish-purple stripes and greenish inside with purplish-brown stripes. 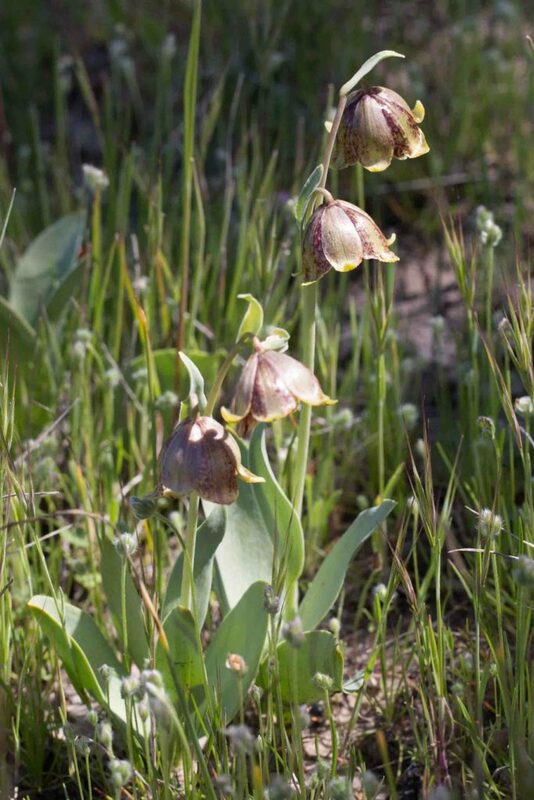 Generally found near the coast. 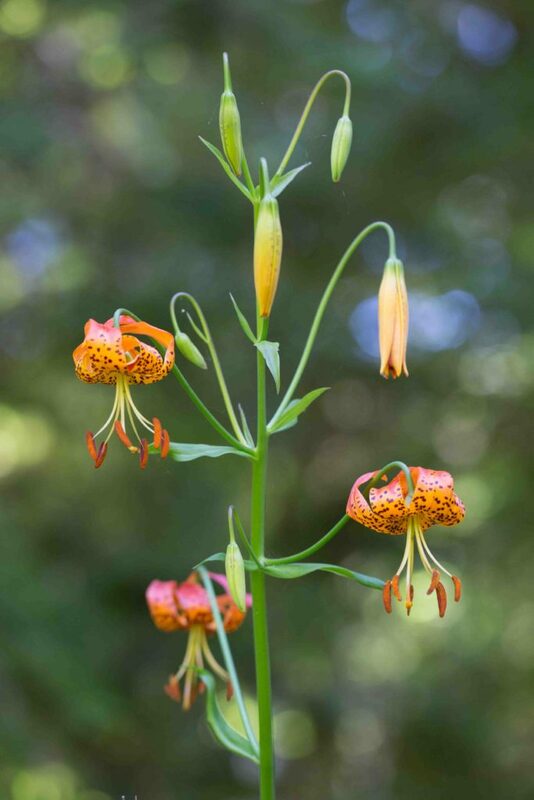 This beautiful and unmistakable lily requires no comment except for the pedantic one that it is better called Leopard rather than Tiger Lily since pardalinum is the Greek and Latin word for the female panther (= leopard), not the tiger. 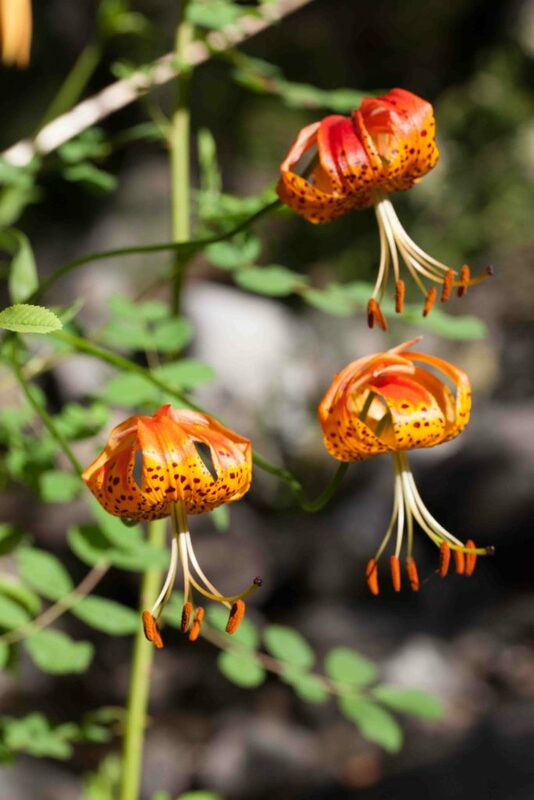 In some parts of the world, these are known as Turk’s-cap Lilies because of the shape formed by the upturned petals. 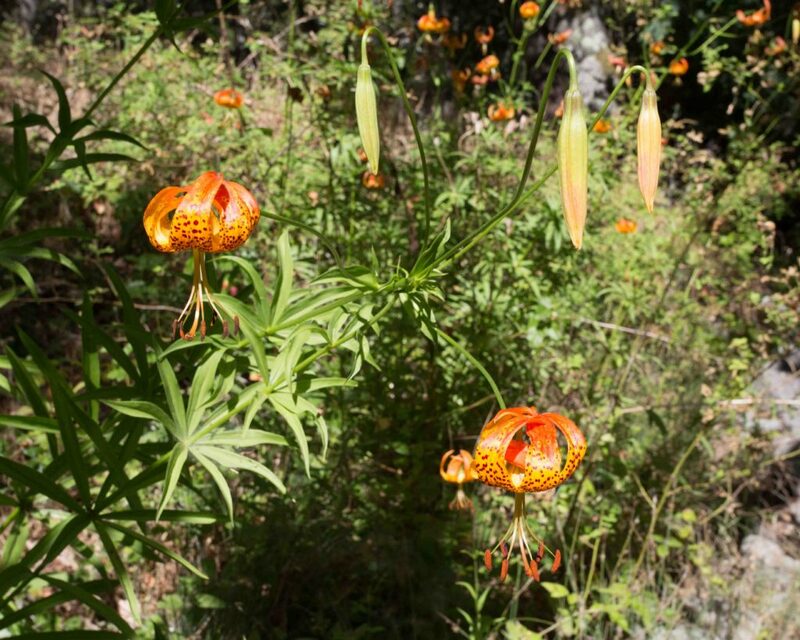 This is not uncommon, but it is inconspicuous. 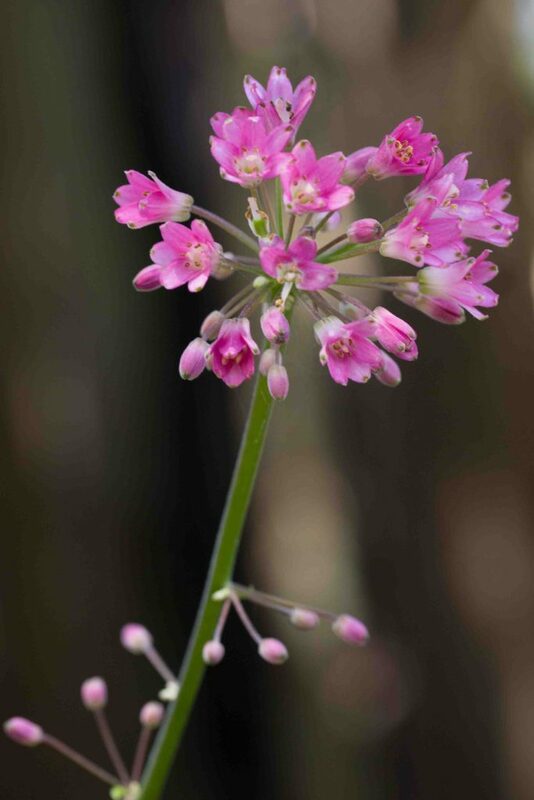 Most easily recognized by its branching growth habit and its alternate, ovate to elliptic leaves with acute to acuminate tips. 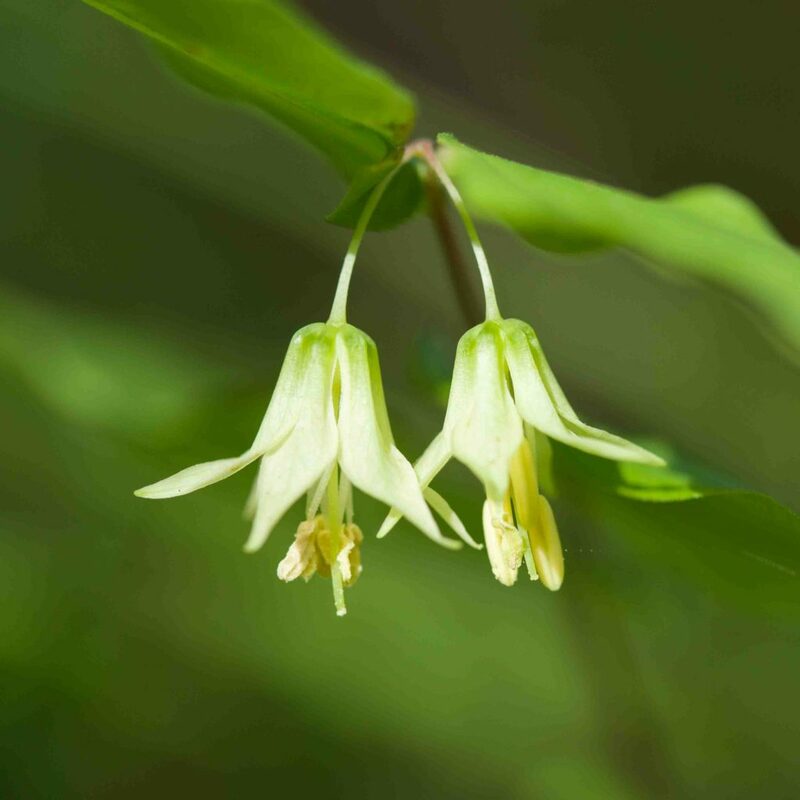 The delicate cream to pale green bell-shaped flowers are below and often hidden by the leaves. 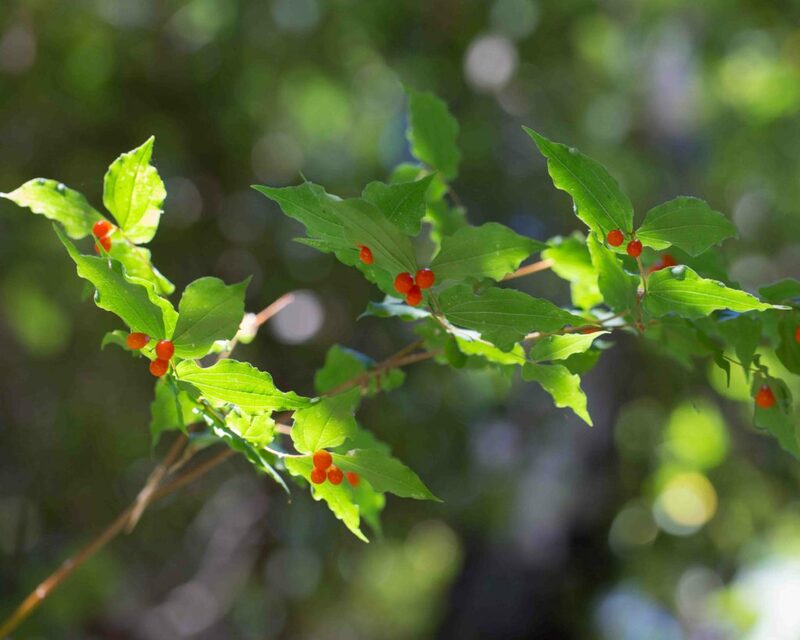 The fruits are bright red berries. 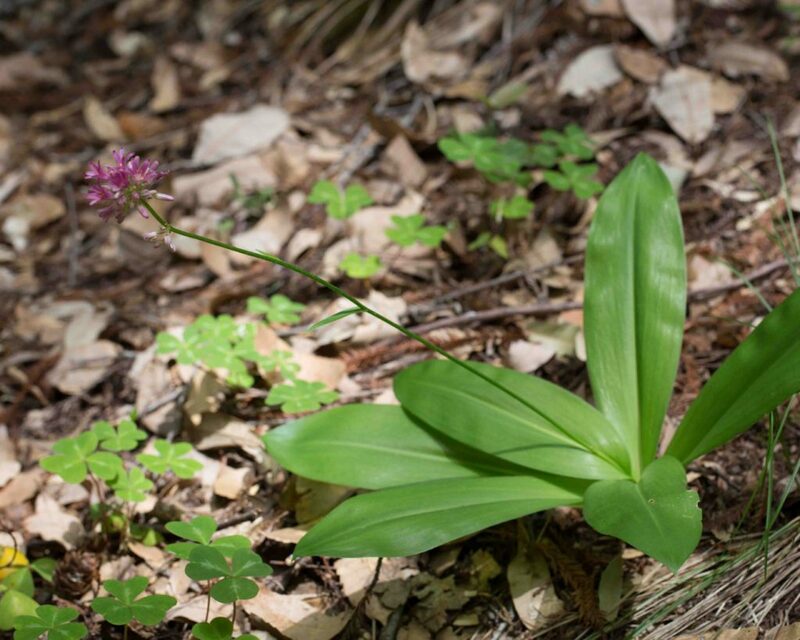 It is often necessary to lift the leaves to find the flowers or fruits.